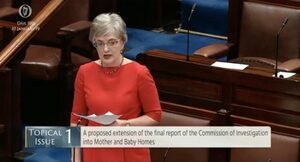 You’ll recall the second interim report from the Commission into Mother and Baby Homes which was given to the Minister for Children Katherine Zappone last September. This interim report was to identify any matters that the commission felt warranted further investigation as part of the commission’s work. Last week Fiach Kelly, in The Irish Times, reported that the indemnity agreement signed in 2002 between the then Minister for Education Michael Woods and 18 religious congregations – which served to cap the orders’ liability – may be extended to include children abused in mother and baby homes. Well-informed sources said the delay in its publication was due to the controversial nature of the proposed form of redress. One source suggested that it may never be published if there had not been public outcry over the commission’s confirmation last month of the discovery of the remains of babies and infants at the site of a former mother and baby home in Tuam, Co Galway. In the Dáil, during Priority Questions. 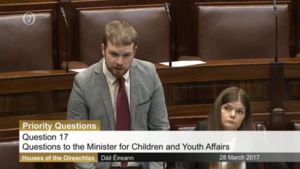 Sinn Féin TD Donnchadh Ó Laoghaire raised the second interim report in the Dail this afternoon after asking what steps the State is taking in regards to protecting unmarked graves – other than the remains recently found at the Bon Secours mother and baby home in Tuam, Co. Galway – in order to prevent them from being interfered with. Mr Ó Laoghaire also claimed that the second interim report does not recommend widening the terms of reference in the Commission into the Mother and Baby Homes. 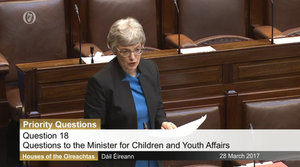 Posted in Misc and tagged Dail, Donnchadh Ó Laoghaire, Katherine Zappone, Mother and Baby Home Commission at 5:28 pm on March 28, 2017 by Broadsheet.